The snow has just melted (at least where I am in Toronto) and as I stare out at my brown, soggy grass I know I need to hire help for the yard this year. The good news is the world is starting to wake up and organic lawn care is now readily available, even out in my suburb. 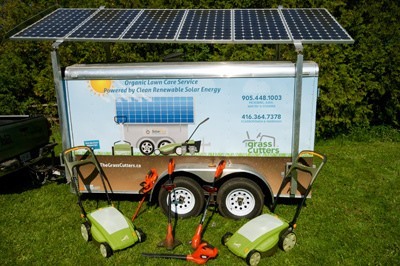 By organic I mean ZERO emissions: a portable solar generator and rechargeable silicone battery power all lawnmowers and additional tools. Organic fertilizer is offered as well as organic weed/pest control solutions. I just think this is the cutest set-up. I can't wait for the day when solar generators are just as common as smokestacks are now. And even if this technology is not available to you (yet) you can order organic fertilizer online. Just another way to go green, right?